A local Brownie pack held their annual bonfire night and fireworks display in Luncarty near the Fair City. A local council has been accused of acting as if it really does have public money to burn by spending more than £8,500 on Friday night’s spectacular fireworks display in Glenrothes. Official fireworks displays in Dundee tonight are not set to fizzle out despite a damp and dreary day. A vehicle containing fireworks in Tayside was "completely destroyed" after it went ablaze. Bus operator Xplore Dundee has said it is prepared to divert buses to protect passengers and drivers alike in the event of any issues on Bonfire Night. Tens of thousands of people are expected to descend on city parks for this year’s firework displays on Bonfire Night. Xplore Dundee was forced to withdraw bus services as firework-hurling yobs caused havoc last nights. A man is to stand trial accused of throwing a lit firework at a pregnant woman as she walked with her 11-month-old child. Police were called out to a Dundee street after yobs set off fireworks. 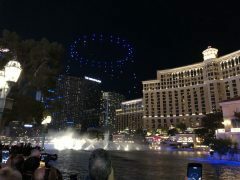 Fleets of light-carrying drones could replace fireworks as traditional entertainment, according to the boss of Intel’s drone group. A man has been charged with throwing lit fireworks towards a pregnant woman and an 11-month-old child. A mysterious 'boy's face' has been spotted in an image of the Tay during Bonfire Night. The skies above Dundee were lit up on Sunday night as local people enjoyed a “celebration” of fireworks. Revellers heading to Dundee’s Bonfire Night celebrations are to enjoy an evening of dry but cold weather, according to forecasters. Scotland's leading animal welfare charity has urged folk to think twice about setting off fireworks. Dundee’s annual bonfire and fireworks display event will return on Guy Fawkes night.